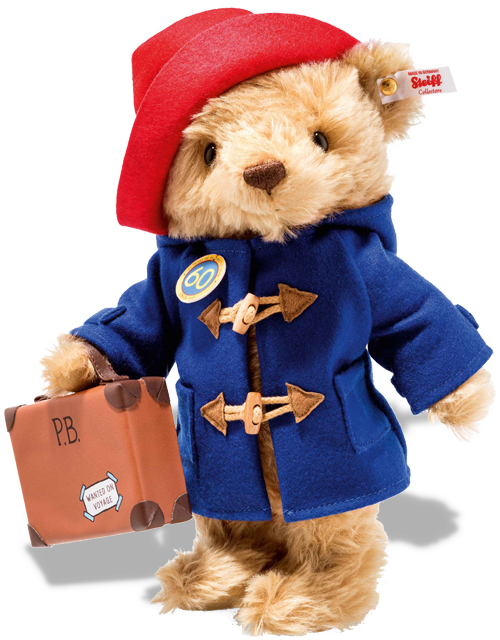 "Beautifully dressed with his own suitcase"
Here we have a beautiful Steiff teddy bear made to celebrate Paddington's 60th Anniversary. He is made from the finest cinnamon coloured mohair and is fully jointed. Cute black eyes and hand embroidered mouth and nose in brown - and just look at his famous outfit. 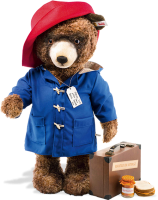 He is wearing Paddingtons blue jacket tied with toggles together with his famous red hat cutely placed covering one of his ears. He is holding the world wide famous Paddington suitcase - on the front are his initials P.B. and a note saying 'Wanted on Voyage'. Finally Steiff have given him a high collectible badge saying '60' - a wonderful way to celebrate a special event. Mrs Brown bent down. 'You're a very small bear' she said. 'And where is that?' asked Mrs Brown. Michael Bond based Paddington bear on a lonely Teddy Bear he noticed on a shelf in a London store on Christmas Eve 1956 - which he bought as a present for his wife. The Bear inspired Michael Bond to write a story - A Bear Called Paddington - first published on 13 October 1958. Little could he have known then how many people around the world would come to know, love and adore this wonderful bear from darkest Peru. Paddington is eternally optimistic and always comes back for more, no matter how many times his hopes are dashed. It's simply the joy of a little bear who is an outsider getting into scrapes and mishaps - always with the best of intentions - and coming out on top every time. A real Steiff bear collectors piece and a Limited Edition of only 1,958 pieces.